Sustainability leadership efforts at the University of New Hampshire have contributed to a groundbreaking initiative to measure and reduce the nitrogen footprint left behind by campus activities like food waste and energy consumption. The new research is highlighted in the April 2017 special issue of Sustainability: The Journal of Record. The publication outlines research being done at UNH, and seven other institutions, to reduce emissions of reactive nitrogen (all forms of nitrogen except unreactive N2 gas) and prevent negative impacts on such things as water quality, air pollution, and climate change. Leach, who is also a guest editor on the special issue, worked with Jennifer Andrews, a project director at UNH’s Sustainability Institute, to integrate the Nitrogen Footprint Tool into the next generation Campus Carbon CalculatorTM, originally developed at UNH in cooperation with Clean Air-Cool Planet. A paper in the journal’s current publication focuses on that work and outlines a newly developed tool that will measure both campus carbon and nitrogen footprints. The online tool will be launched in Fall 2017 and will give accessibility to hundreds of campuses to record and keep track of their own nitrogen and carbon footprints. 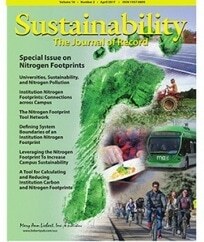 The journal’s special issue features the first completed university-wide nitrogen footprint results. It brings together authors from eight institutions, including UNH, that make up the Nitrogen Footprint Tool (NFT) Network. The NFT helps estimate emissions of reactive nitrogen resulting from every day institutional activities like campus food service, energy use, transportation, fertilizer on grounds, and research activities. The publication features research, case studies and commentaries that call attention to the nitrogen footprint’s impact and ways individuals and administrators can reduce it with strategies like simple food choices (vegetable protein rather than meat protein) and switching to renewable energy. Research by John Aber, professor of natural resources and the environment, and Andrews is also included in the issue. Members of the NFT Network include: University of Virginia, University of New Hampshire, Marine Biological Laboratory, Dickinson College, Eastern Mennonite University, Colorado State University, Brown University, and Colorado College. The University of New Hampshire Sustainability Institute is the nation’s oldest endowed sustainability program. UNHSI has a holistic approach to sustainability and incorporates it into the university’s education, research, and practice. Key initiatives of SI include the Sustainability Fellows Program, Climate Solutions New England, Food Solutions New England, NH Farm to School, the NH Food Alliance, and the Campus Carbon Calculator.